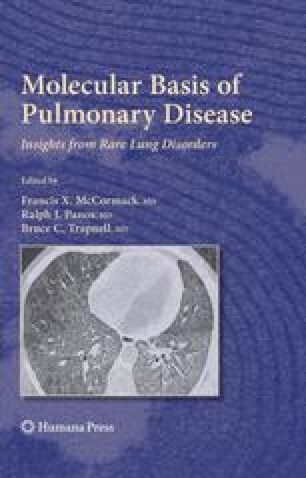 Pulmonary alveolar proteinosis (PAP) is a rare syndrome characterized by accumulation of surfactant lipids and proteins in pulmonary alveoli that can result in progressive impairment in gas exchange and respiratory insufficiency. The serendipitous discovery of PAP in GM-CSF-deficient mice and subsequent identification that neutralizing GM-CSF autoantibodies are strongly associated with PAP in humans led to our current concepts of the pathogenesis of PAP and the central role GM-CSF and alveolar macrophages play in surfactant homeostasis in health and disease. PAP comprises part of a spectrum of disorders of surfactant homeostasis that includes disorders of surfactant clearance and disorders of surfactant production. The former are caused by disruption of GM-CSF signaling (primary PAP) or by an underlying disease that impairs alveolar macrophage functions including surfactant catabolism (secondary PAP). Disorders of surfactant production are caused by inborn errors of surfactant metabolism (surfactant metabolic dysfunction disorders), e.g., mutations in the SFTPB, SFTPC, or ABCA3 genes. Important differences in clinical presentation, natural history, pathogenesis, and surfactant function suggest that these latter diseases should be considered separately from PAP rather than as a form of the same syndrome. The overall prevalence of PAP is approximately 6–8 per million. Ninety percent of cases are specifically associated with high levels of GM-CSF autoantibodies, which has diagnostic importance and has led to common use of the term autoimmune PAP to replace other terms including idiopathic PAP. Autoimmune PAP typically presents as dyspnea of insidious onset; however, up to one third of individuals may be asymptomatic. Whole lung lavage remains the most effective therapy but GM-CSF inhalation therapy is a promising alternative currently in clinical evaluation. Progress in understanding PAP pathogenesis and the role of GM-CSF in surfactant homeostasis and in inflammatory and autoimmune diseases are important benefits derived from integration of basic science, clinical medicine, and translational research. Future studies will focus on pathogenesis, development of improved therapies for PAP and the role of GM-CSF in health and disease. This publication was made possible by Grant Number U54RR019498 from the National Center for Research Resources (NCRR), a component of the National Institutes of Health (NIH). Its contents are solely the responsibility of the authors and do not necessarily represent the official view of NCRR or NIH.